Whenever I'm not 100% sold on a trend I'll make / refashion it myself first before spending any money on something I may fall quickly out of love with. If you follow me on IG you will have noticed that my style is fairly classic. I do occasionally like to try new trends, but I always go back to the classics. The joggers trend for example. I like the look on other people, but wasn't sure about it for me. Plus if I wanted a pair which was long enough I'd have to buy them online and I wanted to try them on first. Oh the drama! So I took a pair of wide leg pants that I wasn't that fussed on and refashioned them. 1. Try pants on inside out & pin inside seam to desired width. I started just above my knee and worked my way down. *Important tip* - make sure you leave the ankle opening wide enough to get your foot out! I may or may not have (totally did) pinned myself into my pants then couldn't get them off. 2. Sew along line of pins & try them on again to ensure you're happy before cutting off the excess fabric. Finish seams. 3. I added cuffs to the bottom of my pants rather than just making a casing to tread elastic at the bottom. This gave me some extra length. The cuffs I used were knit fabric. Ta da! An easy refashion from old wide leg pants to joggers. I've already worn these pants more in their new life as joggers than I ever did when they were wide legged. 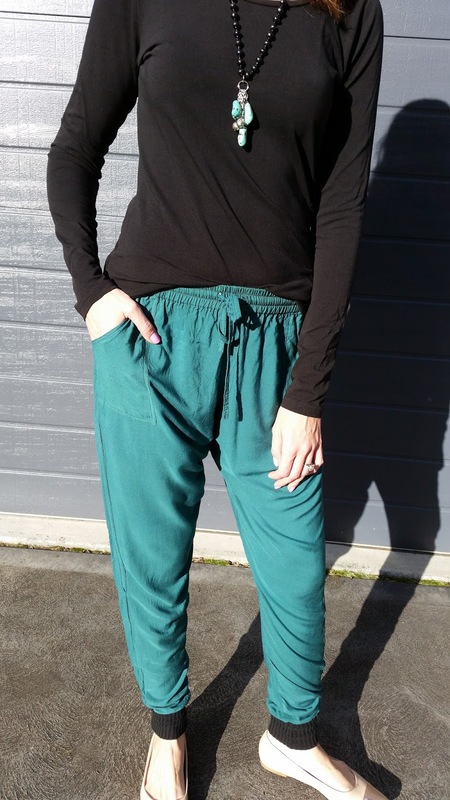 Have you embraced the joggers trend? Such a fun idea! Glad you're getting your use out of the pants now! I have like two joggers. They are more for around the house, as I am short and feel like they are for taller girls! Like the idea to re make something you already own so you're not spending a ton of money of the "trendy" items! Thanks Ruth! I love being able to make or remake clothes that I know I won't wear a lot and are just seasonal trendy items.